Is the housing industry really recovering, or is it just the weather? The mild winter weather undoubtedly boosted the recent batch of housing indicators. However, record low mortgage rates and an improving labor market are also providing some lift to new and existing home sales, and to home improvement outlays as well. The pending home sales index, which reflects demand for existing homes, rose in January, and so did actual sales. However, some of the strength in the index was concentrated in the Northeast, where the winter has been mild. Then again, the index was also strong in the South, where the winters are always mild. The price of Brent crude oil is up again this morning over $124 a barrel. It’s up from $107.65 at the end of last year as a result of increasing tensions with Iran following the imposition by the US and Europe of tough new sanctions on Iran. They are already reducing the ability of Iran to export crude oil. Last year, Iran exported about 2mbd. That is likely to get cut by half or more. That’s not enough to explain why oil prices are soaring given that global oil supply is around 88mbd. Of course, concerns are mounting that the diplomatic and economic confrontation with Iran could turn into a military conflict that would disrupt oil traffic coming out of the Persian Gulf. This certainly explains why oil prices are rising. Global oil demand, on the other hand, is weakening and suggests that oil prices could fall sharply if the Iranian issue can be resolved without push coming to shove. As I’ve explained previously, I believe that the sanctions are rapidly crushing Iran’s economy and may force the Mullahs to give up their ambitions to build nuclear weapons. This may take some time, of course. Meanwhile, if oil and gasoline prices continue to rise, I expect that the Obama administration will coordinate a global release of supplies from the Strategic Petroleum Reserves, as occurred last summer in response to the drop in Libya’s exports. The S&P 500 is back at last year’s peak, which puts the index 101% above its March 9, 2009 cyclical low. It remains 13% below its record high of 1565.15 on October 9, 2007. Our Fundamental Stock Market Indicator (FSMI) is also flirting with its 2011 high. As of the week of February 11, it was at 104.2, up 106% from its cyclical low of 50.6 during the week of April 4, 2009. Last year’s peak was 108.7 during the week of February 26. Holding the FSMI down since 2009 has been the Weekly Consumer Comfort Index (WCCI), which has been hovering in a range between 45 and 60 (WCCI plus 100) since early 2008. It has risen just over the top of this range to 60.2 during the week of February 11 from 55.2 at the end of last year. The latest Commitments of Traders report compiled by the CFTC shows that large speculators and small traders were net long a record 101,926 contracts on February 14. Each contract is for 42,000 US gallons, or 1,000 barrels, of gasoline. During the week of February 10, gasoline inventories in the US stood at 232 million barrels. In other words, speculators and traders, in effect, held a record 43.8% of US inventories. Americans seem to have decided to tune out all the noise coming out of Europe, the Middle East, and Washington and get back to business. They want to get back to the old normal. While Bill Gross sees a world full of new normals and paranormals, the old normal business cycle continues to show that it is still in gear. In the chart above, I overlay the performance of initial unemployment claims following the past four cyclical peaks. The latest cycle looks just like the past three cycles and even the earlier ones too. Jobless claims spike up in recessions. They peak at the end of recessions. They fall sharply early during recoveries. Then they meander for a while at relatively elevated levels above 400,000, causing widespread anxiety that the recovery is jobless. Then they drop closer to 300,000-350,000. 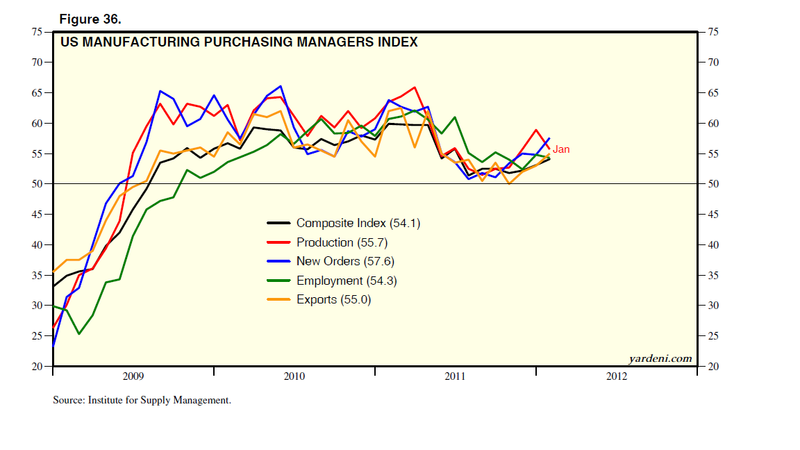 (1) Manufacturing is humming along. Factory output soared 0.7% during January led by a 6.8% jump in motor vehicle production, which accounted for more than half the gain. Also driving the index higher was a 1.8% increase in business equipment, which was attributable to a 2.5% increase in transit equipment, along with gains of 1.5% in industrial and 1.8% in information processing equipment. The latter is at a fresh record high. Auto assemblies jumped in January by 8.2% to 10.2 million units (saar), the highest pace since February 2008. The capacity utilization rate is tracing out an old normal V-shaped recovery. It rose to 77.0% in manufacturing during January. That’s the highest since April 2008. The utilization rate for selected high-tech industries (Computers, Semiconductors, and Communications Equipment) dropped again last month from a January 2011 peak of 80.8% to 69.5% this January. Excluding these industries, the utilization rate for low-tech industries remained at 78.9%, the best since June 2008. Among the industries with the tightest capacity were Machinery (85.0%), Paper (83.8%), and Petroleum (87.9%). Capacity in the auto industry jumped from 60.5% near the end of 2010 to 71.9% in January, the highest since August 2007. (2) Homebuilders continue to see better signs. Housing starts rose last year to 657,000 million units (saar) during December, up 25% y/y. That improvement was led by a 78% increase in multi-family housing starts. Now comes the latest survey data from the National Association of Home Builders (NAHB) showing that single-family housing starts may join the housing recovery this year. The NAHB’s Housing Market Index is a good leading indicator of such construction activity. Debbie reports that the index rose for the fifth month in a row during February to the highest reading since June 2007. (1) Truck Tonnage. For all of 2011, truck tonnage rose 5.9% over the previous year--the largest annual increase since 1998. Tonnage for the last month of the year was 10.5% higher than December 2010, the largest year-over-year gain since July 1998. ATA notes that trucking serves as a good barometer of the US economy, representing 67.2% of tonnage carried by all modes of domestic freight transportation, including manufactured and retail goods. (2) Total Railcar Loadings. I monitor the weekly data on railcar loadings by smoothing out the data using 26-week moving averages. On this basis, total loadings have stalled around the recent cyclical high in recent weeks. They are 19% above the 2009 low, but still 10% below the 2006 record high. Car loads, which carry bulk commodities, remain on a gradual uptrend. Intermodal loadings, which include containers and trailers, are also on an uptrend, which has stalled recently. (3) Railcar Loadings by Product. Since early 2009, there have been V-shaped rebounds in car loadings of chemicals & petroleum products and metals & related products. Still depressed are coal, nonmetallic minerals, pulp & paper products, and waste & scrap material. Lumber & wood products remain depressed, but have been gradually trending higher since early 2010. Most encouraging, and consistent with the Double Recovery scenario, is that motor vehicle loadings rose to a new cyclical high in early February. They are highly correlated with auto production. In a new publication, we chart the relationship between the S&P 500’s forward P/E and various indicators of Risk On/Off since 2007. There is a very high correlation between this P/E and the Citigroup Economic Surprise Index, the 10-year Treasury bond yield, expected inflation in the TIPS market, industrial commodity prices, the price of crude oil, the euro, and the inverse of the trade-weighted dollar. (1) It dropped 38.4% from a cyclical high of 15.4 during the week of June 1, 2007 to a cyclical trough of 9.5 during the week of November 21, 2008. It then rebounded 57.9% to a cyclical peak of 15.0 during September 18, 2009. (2) It took a dive from the 2010 peak of 14.6 during the week of January 15 down to 11.5 during the week of August 27, 2010. It then rebounded again to a 2011 peak of 13.5 during the week of February 18. (3) It fell during the spring of 2011 and took another dive last summer to a low of 10.4 during the week of August 12. Since then, it has rebounded 19.2% to 12.4 in early February. In the past, the market’s valuation multiple tended to rise when bond yields decreased, and vice versa. In the past, rising inflationary expectations often were negative for equity valuations, while falling ones were positive. There relationships have turned topsy-turvy since early 2007, when falling yields and inflation rates started to be associated with falling rather than rising P/Es. That’s because yields and inflation rates are so low that investors fear that they may be harbingers of deflation and depression. Keynesian economists over at the IMF want to stimulate the Chinese to stimulate their economy. The IMF’s China economic outlook report released on Monday urged the Chinese to increase their government budget deficit to 2% of GDP rather than aiming to lower this percentage. What’s the panic about? Well, you see, if Europe’s economy falls into a recession, the Chinese should step on the fiscal accelerator just as they did in late 2008. The IMF recommends cuts in consumption taxes and new subsidies for consumer-goods purchases and for corporate investments in pollution-control equipment. Do you think that the Chinese need or welcome such advice? The Keynesians have spread fiscal recklessness throughout the world, and want to make sure that China participates. In any event, the Chinese are better at monetary than fiscal policy recklessness. No central bank on earth has pursued quantitative easing for as long or on a bigger scale as has the People’s Bank of China (PBoC). The PBoC’s assets have increased by 170% over the past five years to a record $4.44 trillion in December. That compares to $2.87 trillion at the Fed and €2.74 trillion at the ECB. The PBoC accomplished this feat by accumulating foreign exchange reserves, which accounted for a record 83% of the central bank’s assets at the end of last year, up from 40% at the start of 2002. All this liquidity has the potential to boost inflation in China. It did just that over the past three years as the y/y CPI inflation rate rose from a cyclical low of -1.8% during July 2009 to a recent cyclical peak of 6.5% during July 2011. The PBoC responded by, in effect, “sterilizing” some of the increase in its foreign exchange reserves by increasing bank reserve requirements since November 2010. But faced with a slowing economy, the PBoC lowered its reserve requirement ratio by 0.5 percentage point in December, the first such cut since December 2008. 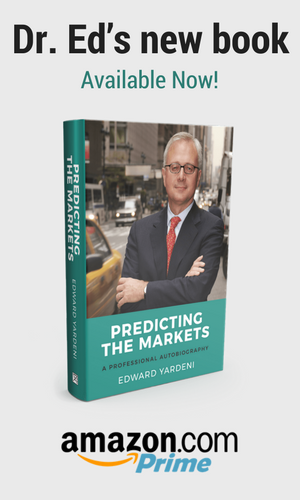 Consensus expected S&P 500 estimates continued to fall for 2012 and 2013 during the week of January 27. They were down to $105.92 and $119.24, respectively, at the end of last month. Forward earnings--the time-weighted average of the two--has been remarkably flat around $107 since mid-August. The bull market from March 2009 through April 2011 was earnings led. Since then, the S&P 500’s volatile trading range reflected the volatility in the forward P/E. I believe that stock prices can move higher over the rest of this year along with the valuation multiple if investors anticipate that earnings growth will pick up in 2013. (1) The monthly first estimates of payroll employment are prone to large revisions. As a result, I prefer to focus on the revisions of the previous two months. November and December estimates were raised by 60,000. Upward revisions are typical during economic expansions. By the way, do you recall how depressed everyone was by last August’s estimate released on September 2? It was unchanged. The latest revised number now shows a gain of 85,000. (2) What happened to all those workers in the transportation and warehouse industry who boosted payroll employment by 50,200 during December? They were supposedly mostly temporary workers, who were supposed to be let go in January. That’s why I expected that January’s payroll gain would be around 150,000 rather than 200,000. Well, it turns out that the new seasonal adjustment factors resulting from the annual benchmark revisions smoothed transportation and warehouse payrolls in December to a gain of only 6,700. In January, this category actually rose 13,100. Last year, I argued that much of the weakness in US and global economic activity was a temporary consequence of the parts shortages attributable to production disruptions following Japan’s earthquake and tsunami. Also weighing growth down was the Fed’s QE2--starting November 2010 and ending June 2011--which perversely stimulated higher food and fuel prices and depressed consumers’ purchasing power and spending. Those drags dissipated during the summer, but all the commotion over American and European debt issues prolonged the soft patch. Now, though, the US economy shows more signs of recovering from last year’s setbacks. In the US, January’s Purchasing Managers Index for manufacturing (M-PMI) rose from 53.1 during December to 54.1 during January. That’s the best reading since June 2011. Between then and now, manufacturing participated in the economic soft patch. Actually, the M-PMI has been improving for the past three months. The major components of the M-PMI were mostly solidly above 50: new orders (57.6, up from 54.8! ), production (55.7, down from 58.9), employment (54.3, down from 54.8), order backlogs (52.5, up from 48.0), and exports (55.0, up from 53.0). 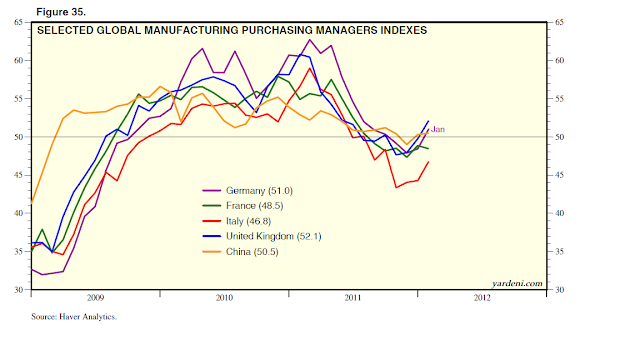 Just as manufacturing is giving a lift to the US economy, it is doing the same to the global economy. How can this be happening given all the dire predictions for Europe? The answer in a word is “Globalization.” The end of the Cold War marked the beginning of Globalization, which is the integration of national economies through rapidly proliferating and rising free trade. Are jobs hard to get? The answer to that question is provided once a month in the Conference Board’s survey of consumer confidence. I think that this is among the most important data generated by this survey and the similar one conducted by the Survey Research Center at the University of Michigan. I am expecting to see fewer respondents to the Conference Board’s survey saying that jobs are hard to get. I reckon this will happen before mid-year. That’s because the response rate to this question tends to lag initial unemployment claims by about 6-12 months. During economic recoveries, the pace of firing tends to drop, as indicated by falling jobless claims. Then, with a lag, the pace of hiring starts to pick up, as indicated by the decline in the percentage of respondents saying that jobs are hard to get.